CHICAGO, IL. 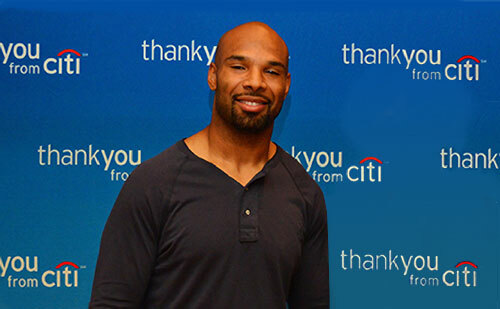 — Join the Citi Matt Forte Monday Night Watch Party 6:30 pm-9:30 pm at the Hard Rock Cafe in Chicago where Citi cardmembers will have the exclusive opportunity to watch prime time football with Matt Forte as Washington takes on Dallas on Monday Night Football. Matt will offer his insight on the game and hold an interactive question and answer session with participants. Age: 21 + years old. Cost: $49. Source: ProCamps. Photo shows Bears running back Matt Forte for Citi Monday Night Watch Party on Oct. 27, 2014 . Matt Forte is an NFL running back for the Chicago Bears. He played college football for Tulane University, and was drafted by the Chicago Bears in the second round of the 2008 NFL Draft. In week 3 of the 2013 season against the Steelers, Forte had a 55-yard run, and the following week against the Detroit Lions, he had a 53-yard run, making him the first Bears running back to record runs of 50+ yards in back-to-back games since Raymont Harris in 1997. Sports Speakers 360 is a booking agent for pro athletes. If you would like to book Matt Forte for a speaking engagement, appearance or endorsement, contact Matt Forte’s booking agent for fees at 1.855.303.5450. This is exclusive to Citi card members only. As of Oct. 13th, there were only 3 spots left.